This fashionista sets the trends in a sassy white trench coat printed with Robert Best’s illustrated designs, a white cotton shirt, and a short black skirt. Her blond hair cascades effortlessly across her shoulders. Black vinyl purse, hammered-look earrings, and black stiletto pumps complete her ensemble. Barbie® doll is exotic and effortlessly elegant in printed cherry red pajama shorts and high collar sleeveless top with oriental detailing and a matching short robe with red sling-back heels. Made of the innovative Silkstone™ material with long black hair and straight bangs, this sophisticated and modern doll is decidedly alluring and evocative. 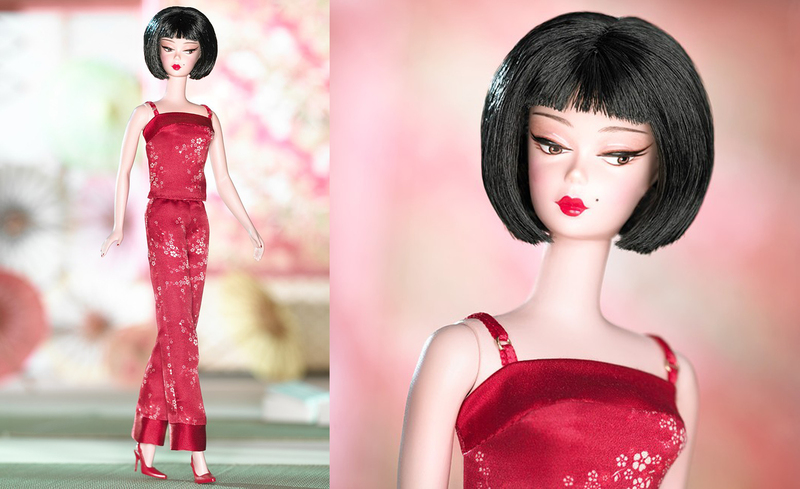 This beauty from the Barbie® Fashion Model Collection wears a short-n-sassy black bob with bangs. Cherry red Asian-print pajamas feature a spaghetti strap top that snaps in the back, and long p.j. bottoms with wide red cuffs. Red high heels complete the sophisticated sleepwear ensemble. 2500 were sold at Barbie Collector and 600 at Barbie Bazaar. This lovely lady wears a darling cherry red Asian-print shortie pajama set featuring a spaghetti strap top and matching shorts. Dark side-parted hair falls just past her shoulders and ends with a flirty flip. Joyeux™ Barbie® is this first-ever holiday doll from the Barbie® Fashion Model Collection. 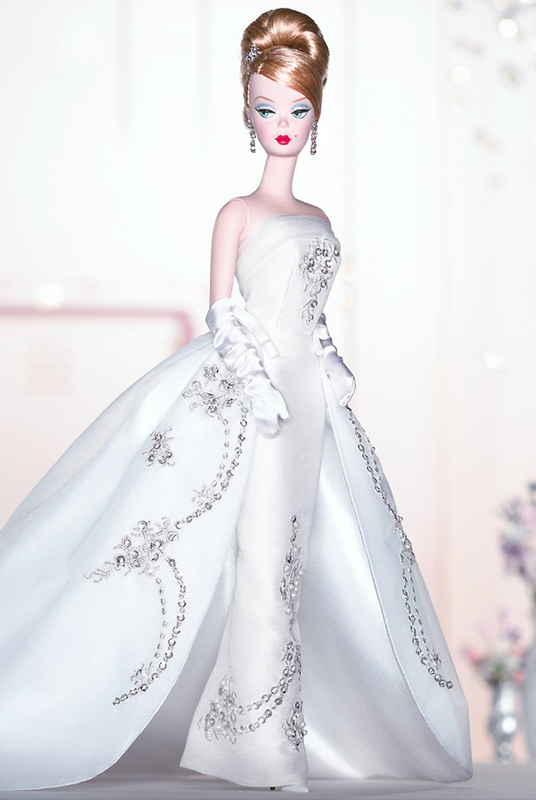 Barbie® wears a dazzling gown perfect for any holiday occasion. A fitted white satin and organza strapless gown is clouded over with a dramatic, detachable overskirt. For added shimmer, silvery sequins and faux pearls adorn this snowy-white showstopper. A rhinestone tiara and drop earrings continue the festive mood. 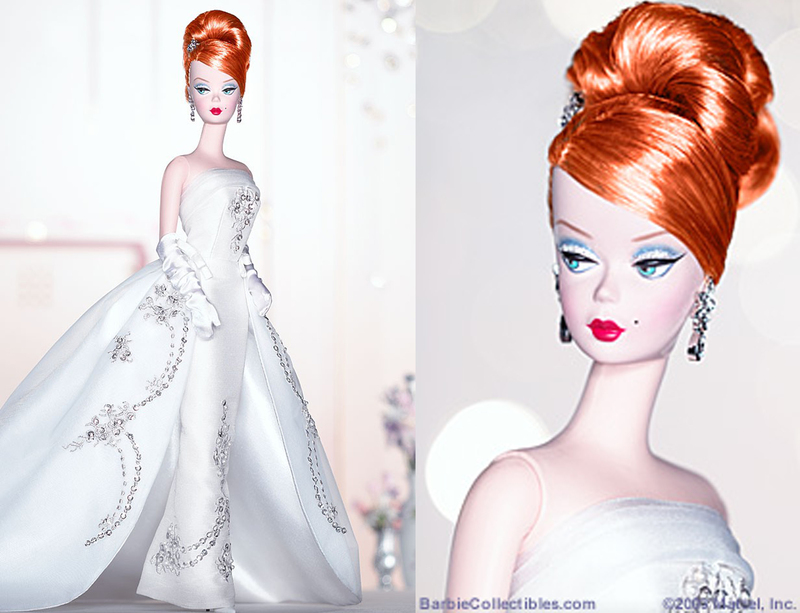 With her upswept strawberry blonde hair and sparkling make-up, Barbie® shines this holiday season. 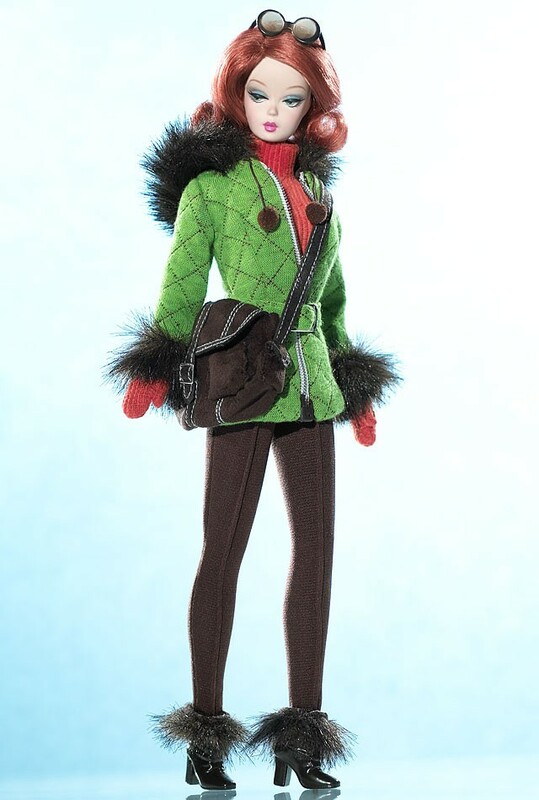 This limited edition redheaded version Joyeux™Barbie® doll is an FAO Schwarz exclusive. She wears a dazzling gown perfect for any holiday occasion. A fitted white satin and organza strapless gown is clouded over with a dramatic, detachable overskirt. For added shimmer, silvery sequins and faux pearls adorn this snowy-white showstopper. A rhinestone tiara and drop earrings complete the festive mood. Barbie® wears a stunning graffiti print form-fitting dress that celebrates her 45th anniversary. A snow white faux fur stole accents her ensemble. Her long platinum blond hair is styled in a braid. She wears rhinestone stud earrings with elegant pearl drop dangles. Barbie® wears a stunning graffiti print form-fitting dress that celebrates her 45th anniversary. A snow white faux fur stole accents her ensemble. Her hair is styled in a braid. She wears rhinestone stud earrings with elegant pearl drop dangles. Barbie® Fashion Model Collection celebrates Barbie® doll’s 45th anniversary. 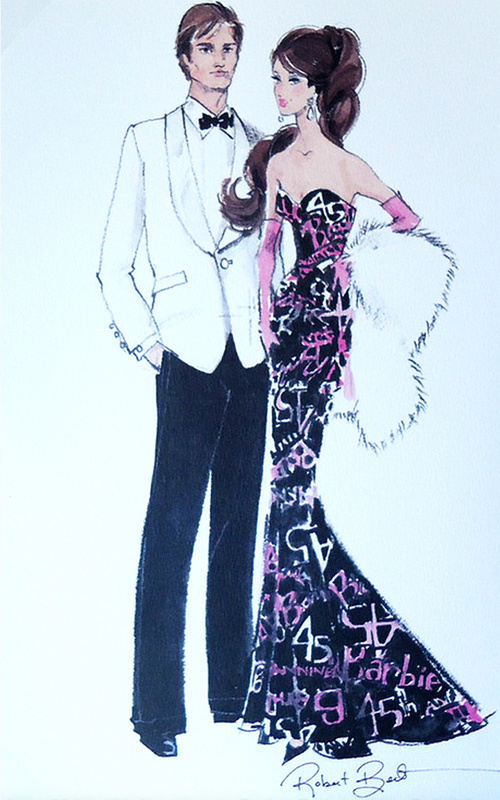 Barbie® doll wears a dramatic black gown, joyously graffiti printed in pink and white. 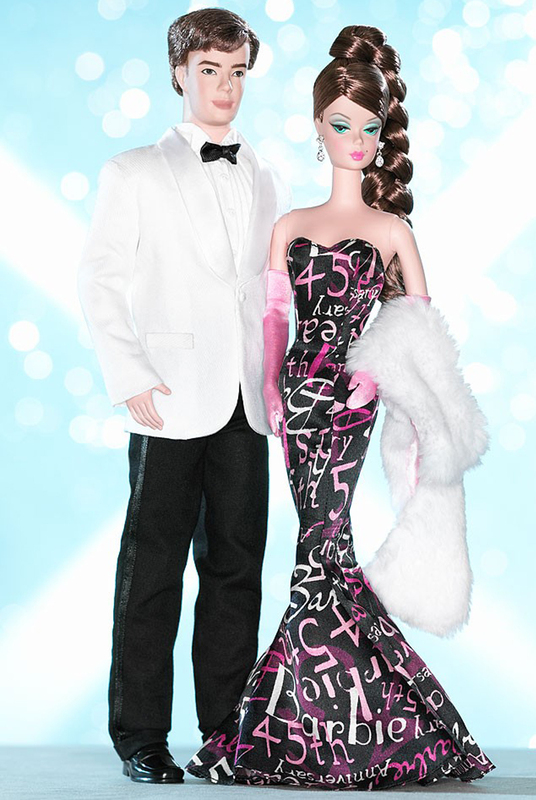 Ken® doll joins the fun in a white dinner jacket with classic black tuxedo pants. 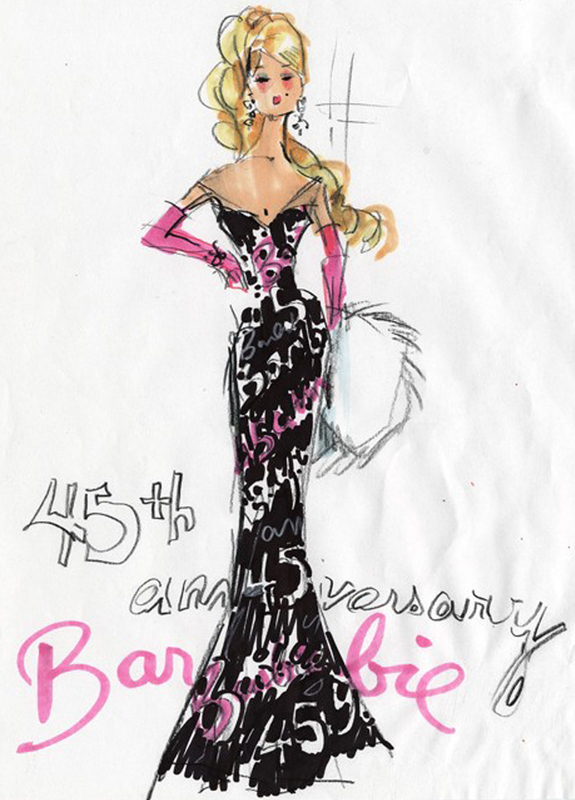 Included in this Limited Edition giftset is a signed sketch of this BFMC™ 45th Anniversary Barbie®. Spend an indulging day at the spa with Barbie®! The Spa Getaway Giftset features Barbie® doll dressed in a two-piece bathing suit with matching sarong. A white terrycloth robe & tote and blue smock are included along with fun and typical spa accessories: water bottle, duckie, “bath beads” and towel. The special feature of this giftset is that Barbie® comes with two wigs! The wigs are assorted red, blonde, and brunette with a surprise two included in each package. This set comes in 3 variations. With an brunette & red wig, red & blond and blond & brunette. This amazing fashion giftset features fabulous ensembles for both Barbie® and Ken®! Barbie® doll’s outfit includes a pale green/ivory jacquard suit with fringe accents on the jacket and skirt. An ivory organza spaghetti strap top, faux animal print purse and pantyhose are also included. A golden beaded chain necklace accessorizes her ensemble. Ken®will look casual and cool when he wears his khaki percale jacket and slacks with white cotton shirt and green and white taffeta tie. His accessories include a belt and socks. Perfect for Vail, Vermont, or even Gstaad, this vivid ski ensemble is available exclusively at Authorized Barbie® Collector Dealers. The outfit includes brown ski pants, brown boots trimmed with faux fur, an orange corded turtleneck bodysuit, and a stylish faux fur-trimmed green ski jacket. Adding to the allure are the awesome accessories – orange gloves, a stylish brown purse, and sunglasses to ward off the glare of the bright white snow. Every beautiful woman requires a suitable place to prepare herself for the day or evening. This perfectly proportioned Vanity and Bench accessory for Barbie® doll is that and more! Distinctively French Provincial and reminiscent of the Louis XV Rococo revival period this set is comprised of wood, golden accents, delicate curves and formal styling. A pair of frosted lamps directed toward the tri-framed golden-edged faux mirror and a light blue pillow atop the bench finish off the effect of dressing room elegance. Includes a variety of bottles and accessories.